Ah, nearly Crimble and Ipswich has got itself a controversial tree of white light. It's stunning, which is why it's surrounded by folks whipping out their phones to snap a quicky pic. Hats off to IBC. In other seasonal news, it's less than a week to the big day, i.e. the first day of the Christmas Radio Times. Woop! I thought we'd established some sort of Light Lunch tradition of heading somewhere a bit nice at this time of year. Turns out that previous festive outings have been to the likes of Cafe Siena (2011), El Taco Loco (2010) and even the caff in Asda (2009). All fine in their own way but not super special. 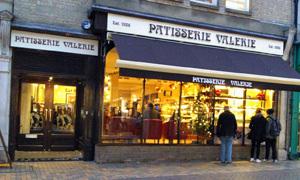 This year, however, we may have saved such a place: welcome to Patisserie Valerie. Diagonally opposite ShakeAway in the Buttermarket and occupying the former premises of an odd shop selling wartime songs on CDs, etc -- Past Times will eat itself -- PV was first spotted during the Tour Of Britain week. Even then, the simple folk of the town were gathering to gawp at the gorgeous gateaux (fancy plural) and peer at the pretty prices. How much is that doughnut in the window?! Despite or because of the cost -- austerity Britain, my beignet -- it gets busy, hence the waiting area by the window. No time to experience that since Andy's already seated. Let's be having you, as they say up in Norfolk. There's attractive smiles by the dozen, and that's just our table. Shiny young servers attend to your every whim, and stood patiently, still a-gleam, while we made our choices. Looking after the pennies, we both opt for two courses for a tenner. Pasta carbonara for him, pasta arrabiata for me, and a refreshing orange & cranberry to sup (with a straw) while waiting. Bit of a wait, then our Italianate meals arrive. Oops, young lady has brought two carbonaras. T'ain't right. Profuse apologies follow, as does the offer of a free drink -- I couldn't possibly -- or a free cake? No, no, oh, go on, then, surprise me. Sweet deal, that one, as a lovingly wrapped package of goodness arrives, easily beating my late pasta. Meantime, Andy, is bolting his down prior to catching a train. Finally, here's my saucy pasta. Yum. PV manages a olde worlde charm with that air of kaffee und kuchen: our old TT friend Rene would like it here, no doubt. Savoury sorted, at last, we both go for the pancakes with maple syrup and mascarpone. They're OK but not a lot better than you'd get with a McDonald's breakfast. Should have gone for one of the posh £4 pastries. Coffee and mocha, though, are top drawer. Whereupon Andy decides to skip that train and catch the next one instead, further confuddling the waitress. Lovely service and atmosphere -- like a corporate version of the delightful Tea Boutique -- though you'll need to dig into your savings before you come on over to Valerie. If it was a car -- Citroen Dyane. If they were passing by -- Valerie Singleton.